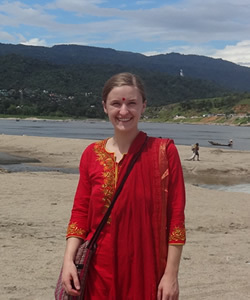 During June 2014 undergraduate student Kendra Layton conducted interviews in Bangladesh as part of an ongoing initiative of the Berkley Center for Religion, Peace, and World Affairs and the Center for Social Justice Research, Teaching and Service at Georgetown University. Hosted by Caritas Bangladesh, Kendra researched how the organization supports the hardest-to-reach students throughout the country, such as those who are indigenous, live in slums, with disabilities, and in rural areas. Caritas, established by the Catholic Bishops’ Conference of Bangladesh, strives to accompany the poor and the marginalized and promote social welfare and development. By examining two specific projects, Notre Dame Literacy School and Aloghar (Lighthouse) Project, Kendra investigated how Caritas supports the hardest-to-reach students while simultaneously considering sustainability and infusing faith in their work.